I like EZCONNECT because it is simple when we know the host:port, and I like External Password Files because I hate to see passwords in clear text. But the combination of the two was not easy before 19c. 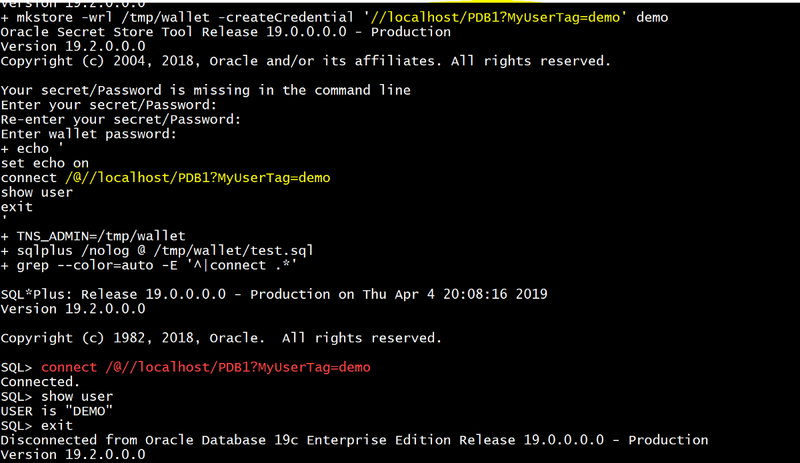 Of course, you can add a wallet entry for an EZCONNECT connection string, like ‘//localhost/PDB1’ but in the wallet, you need a different connection string for each user because it associates a user and password to a service name. And you have multiple users connecting to a service. and then define a credential for each one. But that is not possible with EZCONNECT. Or you have to define a different server for each user — which may not be a bad idea by the way. Copyright (c) 1997, 2018, Oracle. All rights reserved. I do not use it for applications. The host name is not a problem as I can have a DNS alias for each application, but I don’t want the listener port hardcoded there. Better a centralized tnsnames. ora or LDAP. However, for the administration scripts like RMAN backups or duplicates, or Data Guard broker, a simple passwordless EZCONNECT is easier.